The Water of Kane and Other Legends of the Hawaiian Islands. 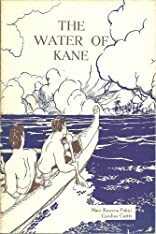 Water of Kane and Other Legends of the Hawaiian Islands was written by Mary Kawena; Curtis, Carolyn Pukui. Water of Kane and Other Legends of the Hawaiian Islands was published by The Kamehameha Schools Press. About Richard Goings (Illustrator) : Richard Goings is a published illustrator. A published credit of Richard Goings is The water of Kane and other legends of the Hawaiian Islands,.